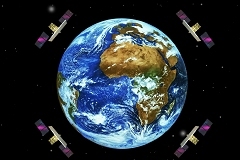 The COSMO-SkyMed constellation (Constellation of Small satellites for the Mediterranean basin Observation) is a project of the Italian Space Agency (ASI) tailored for risk management, coastal zone monitoring and sea pollution in a dual use approach (military and civil applications). The COSMO-SkyMed payload is constituted of a fixed antenna with electronic scanning capabilities in both the azimuth and the elevation planes. It has been designed to implement three different operation modes in order to acquire the images at the required resolution: Spotlight mode, Stripmap mode and ScanSAR mode. COSMOSAIC is a project of Cosmo-SkyMed UGS (User Ground Segment) Program, that defines and implements the mosaicking processor for SAR(1B - Detected Ground Multi-look product- , 1C - Geocoded product GEC-, and 1D - Geocoded product GTC- products) and DEM images acquired by the Cosmo SkyMed satellite platform. The processor performs a coregistration to remove coarse errors from the images and then applies the mosaicking according to two different ways. The first one method is faster but less precise than the other one. The Cosmo-SkyMed processor deals with the assembling of SAR images or DEM into a common grid, in order to generate large scale "Mosaicked Products". The Mosaicking Processor realised by Planetek Italia is able to mosaic two or more raster images in order to obtain a single output image.